When you arrive at the door of the McKittrick Hotel for Gallow Green's Brunch, you'll be greeted by a tall, striking (probably) male model who hates brunch, and checks your reservation to whisk you through the door. Then, you'll enter an elevator with a funny little attendant in a bowtie and vest, and exit on the 2nd floor. Finally you will ascend a staircase and open a door to a lush, green, rooftop garden straight out of a fairy tale. 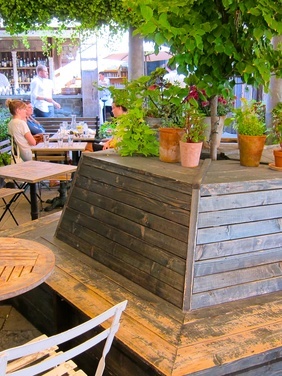 You must go here soon as Gallow Green's Rooftop Brunch is only available in the summer. For $45, you have unlimited access to a spread of decadence, including gooey cinnamon rolls, créme fraiche scrambled eggs, warm biscuits with butter and jam, baked ham, veggies, and an amazing bread pudding topped with a bourbon caramel sauce. Chef Ricky King is very accessible and involved in the meal, keeping the spread fresh and warm. The prix fixe also includes Unlimited Beverages-- bloody Marys, mimosas, fresh squeezed juices, coffee, and more. Plus, they will taste even better as you enjoy them while listening to live jazz. It completes your entire experience.